And even though I now try to meditate regularly (15 minutes a day), I feel like I've fallen a bit off the "meditation bandwagon" lately. As if it was a call from the universe reminding me to get back onto my (imaginary) meditation cushion, I recently got an invitation from Nikki and Kevin from Centred Meditation to come by their meditation studio. 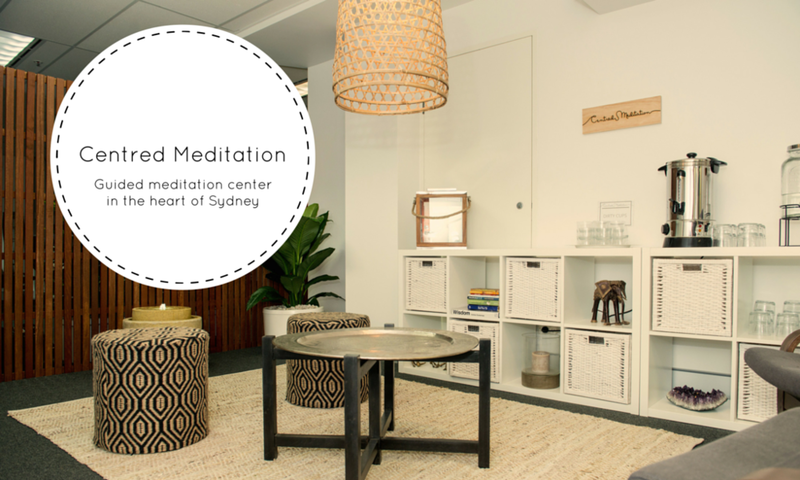 Centred Meditation is a contemporary meditation studio in the heart of Sydney's CBD that offers 30min guided meditation sessions for the urban professionals to escape the hustle and bustle of everyday life. The studio is an urban sanctuary giving your body all the cues it needs to de-stress: a relaxing atmosphere, diffused soothing scent, warm calming tea and comfortable armchairs with lots of cushions and blankets. And so I went to meet the two and sat in awe as I listened to their inspiring stories over a cup of freshly brewed tea. Since discovering the effects of meditation on their own lives and travelling through India for an entire year, Nikki and Kevin have been determined to make meditation more accessible to everyone and to dispel the misconceptions surrounding it. I'm sure we all have that one friend that still thinks meditation is something for hippies or religious people. And most people still mistake meditation as sitting cross-legged and suppressing any thoughts, but it is anything but. Society is moving at an exponential rate. We are more time-poor, over-worked, and under pressure than ever before. Stress caused by financial burdens, relationship troubles, work deadlines, and even traffic jams are having detrimental effects on our health and well-being. In short, what is stress? Perspiration increases to cool us down and allow water to be secreted through the skin instead of the kidneys and bladder. The worst part is that it takes 20-60 minutes for our bodies to return back to normal once the ‘threat’ has been alleviated. That results in many hours of the day being spent in this state, which as you can imagine has all sorts of long-term health ramifications. For example, our sleep is impacted, our memory gets impaired, our immunity is lowered, our digestion gets affected, our skin ages faster and the list goes on. Essentially, a response which is life-saving in combat becomes life-threatening in daily modern life. Indeed, research confirms that stress is a contributing factor in cancer, coronary heart diseases, diabetes, Alzheimer’s Disease, Infectious diseases, Hypertension, back pain and more. During meditation, a particular physiological response is triggered in the body known as the relaxation response, a term coined by Dr. Herbert Benson. The relaxation response is the process of de-escalating our stress mode and inducing deep relaxation through the activation of the parasympathetic nervous system. Meditation has been an area of interest for researchers since the 1950s and even more so in the last decade. There are now thousands of scientific studies which all give evidence to the countless benefits that regular meditation has on our health and well-being. And this list is by no means extensive. Meditation is medicine, literally. Looking at this list of studies, it's hard to believe some people actually still question whether meditation can have a positive effect on mind and body. So, what are you waiting for? Get on that meditation cushion! And if you're in Sydney, why not join Centred Meditation at the Winter Wellness Series event on the 29th of October in Bondi? You can get your FREE ticket for that here. A big thank you to Nikki and Kevin from Centred Meditation for sharing your knowledge with us, it was a pleasure having you! You can give them a follow here. P.S. : If you want to delve deeper into the topic, I recommend learning more about how meditation can actually change the brain structure. If you'd rather watch a video, how about this TED talk?